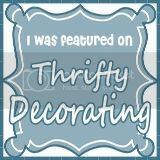 I was so excited when Nicole from Thrifty Decorating asked if I would be interested in guest posting at her bog. Ummmm….YES PLEASE! She has a wonderful blog full of inspiration. I was giggling when she posted her last project. I had been trying to decide how how to hang all the girls hair bows and clips. I have an old window and some chicken wire and I was debating if I could turn it into a place to hang all the girls accessories. Well, I am no longer debating after seeing Nicole’s daughters room. The window is perfect. You really need to go check it out! This is something that I will be doing soon.